Bangladesh, at least 5 people, including a 5-year old child, have been killed and another 6 are missing in southern coastal areas of Cox’s Bazar and Bhola, with Bay of Bengal cyclone ‘Komen’ expected to make landfall this evening. the child was killed when a wall collapsed in Moheshkhali island while 3 others died in a boat capsize in the same area. Another man was killed in St. Martin island, off Cox’s Bazar when a coconut tree fell on him. Meanwhile officials of the Ministry of Disaster Management & Relief have said that over 2,60,000 people have been temporarily relocated in 288 cyclone shelters in Cox’s Bazar. Bangladesh Inland Water Transpor Aauthority has suspended all operations on all water routes throughout the country. Ferries have been halted, river ports have shut operations, and marine ports of Chittagong, Mongla and Pyra have been put under danger signals. Meanwhile Bangladesh Meteorological Department Director Mohammed Shah Alam has said the intensity of the cyclone is unlikely to intensify any further. About a hundred houses have been destroyed in the winds at Teknaf of coastal Cox’s Bazar. Thousands of people bid an emotional farewell to former President APJ Abdul Kalam who was today laid to rest with full state honours in his home town in Rameswaram amid chants of “Bharat Mata Ki Jai”. The body of Kalam was buried in the middle of a 1.5 acre piece of land earmarked for the purpose at Peikarumbu after being brought from his family mosque where special prayers were offered. The “People’s President” was accorded full military honours, including gun salute and playing of the ‘Last Post’ as the members of his family and local Jamath lowered his mortal remains into a trench as slogans of “Bharat Mata Ki Jai” rent the air. 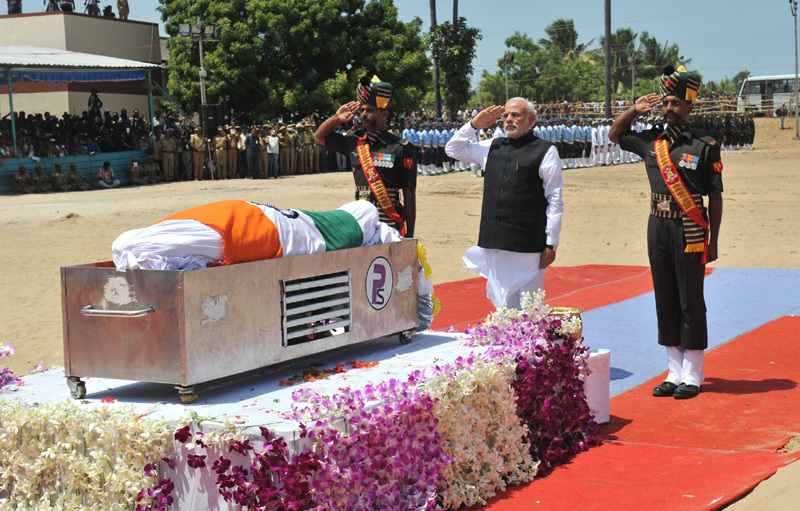 The funeral of the “Missile Man” was attended by a galaxy of leaders including Prime Minister Narendra Modi who placed a wreath, offered his final salute and stood in silence in front of Kalam’s body that was draped in national flag. He also went around the casket with folded hands. The Prime Minister later went up to Kalam’s eldest brother 99-year-old Mohammed Muthu Meeran Lebbai Maraicker, who was seated nearby, and offered his condolences. Congress Vice-President Rahul Gandhi also paid his last respects to Kalam, who died of cardiac arrest in Shillong on Monday. Besides some foreign dignitaries, several leaders including Governors of Tamilnadu, Kerala, Meghalaya, Defence Minister Manohar Parrikar, his cabinet colleague M Venkaiah Naidu and state Finance Minister O Panneerselvam were present. Congress leader Gulam Nabi Azad and Chief Ministers of Karnataka, Kerala and Andhra Pradesh and CPI-M veteran V S Achuthanandan were also among those who paid their homage. The three services chief also paid their respects to their former Supreme Commander. Earlier, a large number of teary-eyed mourners swarmed the carriage carrying his mortal remains and briskly moved with it on the last journey of the 83-year old scientist. Condolences poured in from the country and across the world, paying respects to the affable man who endeared himself to the masses with his simplicity. Tight security, including deployment of Naval, Coast Guard and Marine police personnel in the sea around the town, was put in place in view of the convergence of several dignitaries. Lok Sabha and the Rajya Sabha have been adjourned till tomorrow. The lower house was adjourned as a mark of respect to former President Dr. A.P J Abdul Kalam while Upper house was adjourned amid noisy scene by the Congress members. As the House met for the day, Speaker Sumitra Mahajan said as the last rites of Dr Kalam were in progress, the House is adjourned for the day. She also made obituary references to three ex-members of the House and the martyrs of terrorist attack in Gurdaspur. Mrs Mahajan recalled the contribution of the late members. In Rajya Sabha, when the House was reassembled at 2 pm, Deputy Chairman P.J.Kurien allowed the Home Minister to make a statement on the terrorist attack in Gurdaspur, Punjab. Mr. Rajnath Singh read out the statement amid slogan shouting by the Congress MPs. Mr. Kurien repeatedly appealed for order but in vain. When the Congress members did not relent, he adjourned the House for the day. 1993 Mumbai serial blasts lone death row convict, Yakub Memon has been executed. Additional Chief Secretary (Home) Maharashtra KP Bakshi told media that Memon was hanged at the Nagpur Central Jail around 7 this morning. The execution was carried out about two hours after Memon’s lawyers’ last-gasp plea, to get the death warrant stayed, was dismissed by the three-judge bench comprising Justices Deepak Mishra, Amitava Roy and Prafulla Chandra Pant in an unprecedented hearing that began in the wee hours today and ended at dawn. After President Pranab Mukherjee and Maharashtra Governor rejected Memon’s mercy petition yesterday, his lawyers moved the apex court again late last night seeking stay of his hanging. Yakub Memon’s body was brought to Mumbai this afternoon from Nagpur by a special air ambulance amid tight security. His relatives accompanied the body after jail authorities handed over it to them. His execution was carried out this morning at around 7 am at Nagpur central jail. Yakub became the first convict in 31 years to be hanged to death in Nagpur Jail and the fourth in the country in the last 10 years. His burial is likely to take place at ‘Bada Kabrastaan’ in Marine lines amid tight security in the afternoon. The Quick Response Teams of police, formed after the 26/11 terrorist attacks, has also been deployed at a few places including the Al Hussaini building in Mahim area where the Memon family lives. Chief Minister Devendra Fadnavis will make a statement in the Assembly regarding Yakub’s execution later in the day. On 12th March, 1993, a series of 13 explosions rocked Mumbai, resulting in 257 fatalities and injuries to 713 others. Several conspirators and masterminds of the worst terror attack on the country including underworld don Dawood Ibrahim, his right hand man Chhota Shakeel and Yakub Memon’s elder brother Tiger Memon are still absconding and are believed to be sheltered in Pakistan. On April 10th, 1995, 26 accused were discharged by the TADA court and charges framed against the remaining accused. On March 21, 2013, the Supreme Court upheld death sentence of convict Yakub Memon, Tiger Memon, and commutes death sentence of 10 convicts to life term. Life imprisonment of 16 out of 18 convicts also upheld. Kuwait has busted a terrorist cell of the Islamic State group, the country’s Interior Ministry said. It included five Kuwait nationals, some of whom fought for Islamic State in Iraq, according to the Kuna news agency. Bekijk het complete agenda overzicht » E-mail niet juist weergegeven? Bezoek RAI Amsterdam en waan je bij elk evenement in een andere wereld. Laat je verrassen en verrijken door innovatieve producten, kennis, creativiteit en zoveel meer. Ontmoet mensen van ver en van dichtbij. Een bezoek verlegt grenzen, het inspireert. Beleef het zelf tijdens één van onze evenenementen dit jaar. 12 december is de 100ste geboortedag van Frank Sinatra. In het RAI Theater wordt een groots theaterconcert georganiseerd om ‘The Voice’ op fenomenale manier te herdenken. Hadewych Minis, Greetje Kauffeld, Jon van Eerd, Tania Kross, Ruben Hein en Matt Dusk worden begeleid door het Metropole Orkest. by presenting a live Musical Show with Bollywood Singers & Musicians. You are requested to send correspondents/photographers/camera crew for the Musical Evening. At least 16 people have died after landslides triggered by heavy rains swept away two villages in quake-hit Nepal on Thursday. Rescuers were searching through rubble for some 32 people believed missing in the western district of Kaski. Eighteen people were injured in the disaster in the foothills of the Himalayas, 150 kilometers west of Kathmandu..